The motional inductance and motional capacitance of a crystal are of importance when designing crystal filters. For example, one may wish to measure the parameters of a set of crystals and select closely matching crystals for construction of a crystal filter. David Gordon-Smith G3UUR developed an easy method for measurement of the motional parameters, in which a Colpitts oscillator is used and the change in frequency measured when a known series capacitance is switched in and out of the crystal circuit. This page describes my measurement of 50 10.14MHz crystals. Co is the crystal holder capacitance. I assumed that this means the measured capacitance of the crystal when not in circuit. Cs is the series capacitance, which includes stray capacitance of the circuit wiring and switch. f is the oscillation frequency when the switch is closed (series capacitance shorted out). Df (Delta f) is the change in oscillation frequency when the switch is opened. Andy Smith G4OEP did some an excellent derivation of these equations, Click here to see! G3UUR used a Colpitts oscillator but I wanted to build a Butler because it's been an oscillator topology I have wanted to try for a long time. I made the assumption (perhaps incorrectly) that the same equations apply. My Butler oscillator circuit diagram is shown below. Thanks to OM John VK6JY for kindly supplying the computer-drawn diagram. Click also below my original hand-drawn diagram (left) and a larger computer-drawn one by VK6JY (right). 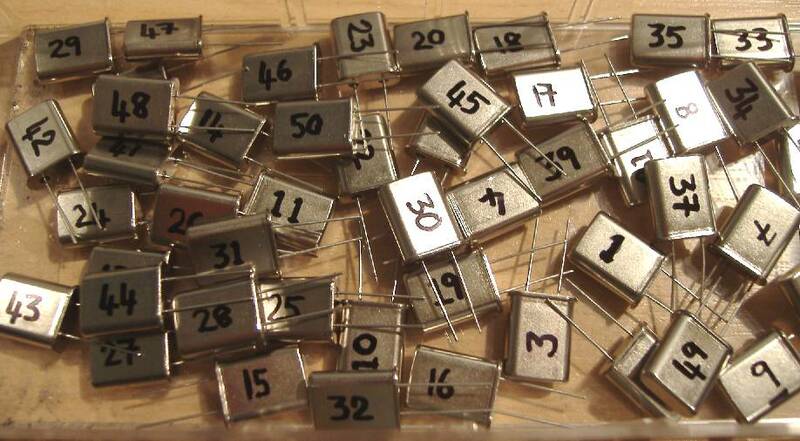 I tried a number of different transistors and they all worked fine. 2N2222, BC108, etc. should all be a good substitute. The 2N2369 was just the first one my hand landed on in the junk box. The reason for using a small SIL reed relay to switch the capacitors, rather than just switching them directly with a manual switch, was that I thought it would allow me closer control over the capacitance without possible variations in capacitance of the switch, or my hand being close to it and so on. I used a T37-6 toroid because one happened to be available in the junk box. 30 turns is the most which I could fit on that sized toroid, and so the capacitance was sized accordingly: the resonant tank circuit consists of the 100pF fixed capacitor with parallel 30pF trimmer, and the 25-turn section of the primary between the transistor collector and positive supply voltage. The tuning of the 30pF trimmer is quite sharp. 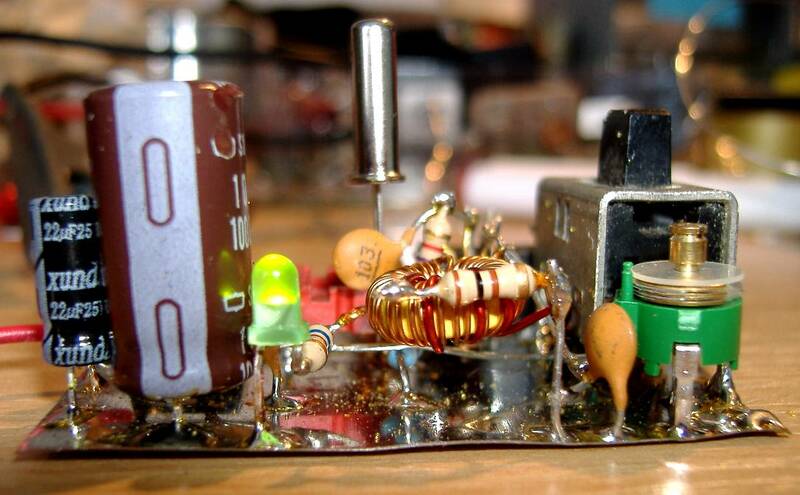 I built the circuit on a 52 x 37mm rectangle of tinplate, which used to be the wall of a 200g tin of Heinz baked beans. This is a great substrate for the "ugly" construction method and soldering to the tinplate is even easier than soldering to single sided PCB. Note that the 200g half-sized tins are better than the larger size, since the larger sized cans have corrugated sides for additional strength, which can be used but is not ideal. I included an onboard 7812 voltage regulator. I used an 8-pin DIP IC chip as a crystal socket. Pins 1 & 3 were connected as the crystal socket. I like to include a small LED (in this case a 3mm green junk box LED) so that there is an instant visual indication that the circuit is switched on; I connected it to +12V via a 560 ohm resistor (the LED and resistor are not shown in the above circuit diagram). The photos below can be clicked to show full size versions. 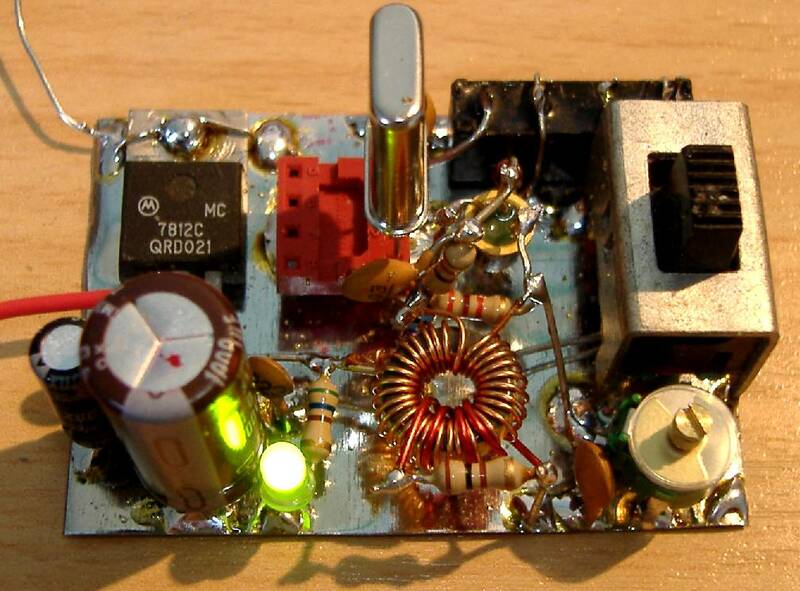 The Butler oscillator produced in excess of 3V p-p sinewave into a 100 ohm load resistor (11mW power). 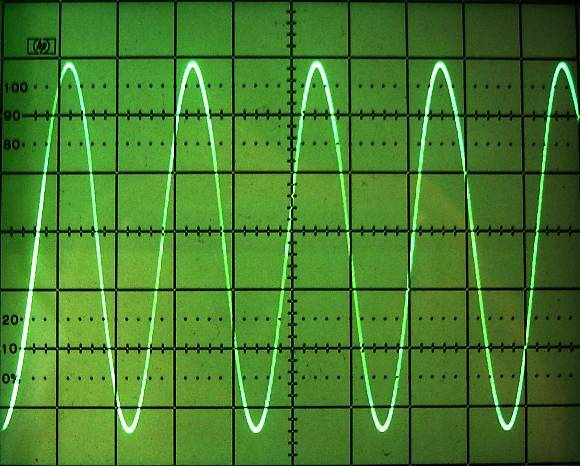 See above HP1741A oscilloscope image where the horizontal scale is 0.05us/div and the vertical scale is 0.5V/div. My AADE LC-meter was used to measure the capacitances, Co was 3.5pF and Cs was 43.4pF. Frequency measurement was on a Racal 9911 frequency counter. This instrument was tested and calibrated on 12-Mar-04, and the timebase oscillator set at ambient temperature 19C. It was allowed to warm up for some time (7 hours) before the measurements were made. I cannot be certain of the absolute frequency measurements since I could not measure the ambient temperature nor vouch for the accuracy of the calibration. The frequency measurements could therefore be inaccurate. In the table below, "Freq" is measured with the relay closed (series capacitance shorted out); "Freq s" is the frequency with the series capacitance in circuit; Motional Capacitance Cm is stated in femto Farads where 1000fF = 1pF; Motional Inductance Lm is stated in mH (milli Henries). The crystals were marked with numbers 1 to 50 using a black permanent ink pen. The arithmetic mean and standard deviation of each column of results is shown at the bottom of the table. I was quite pleasantly surprised by how closely matched the crystals were. 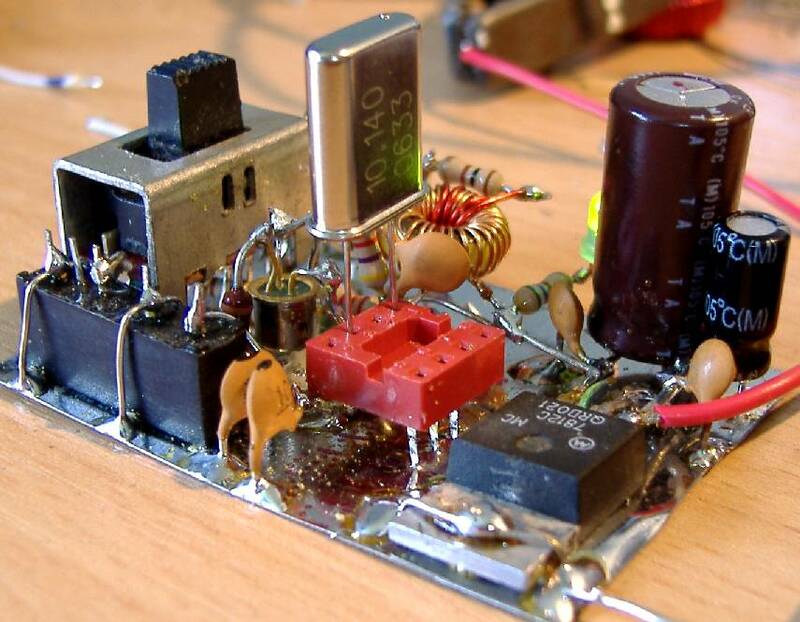 Many thanks to Christian DL6JAN for supplying the 10.140MHz crystals, and to David VK6DI for information and encouragement on the Butler oscillator circuit. Finally too to Heinz for producing such excellent baked beans, and supplying them in such fine tinplate sheet metal. Perfect sustenance for homebrewers and perfect raw materials for homebrewing, respectively.